Abel Tasman National Park was a war-time baby, born in 1942 to protect the wonderful sequence of forested beaches and headlands, and which have become much-loved by both countless New Zealanders and visitors alike. 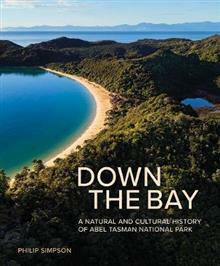 Down the Bay is a tribute to this gem of New Zealand's national p... read full description below. Award-winning writer and ecologist PHILIP SIMPSON lives next to Abel Tasman National Park and works for Project Janszoon. His previous books, on cabbage trees, pohutukawa, rata and totara, all combine natural and cultural history, the latter including Maori and European values towards the trees, and he transfers this perspective to the park. For four years he has tramped through the park studying the plants and animals, geology and soils, as well as researching the human history through the libraries and museums of New Zealand, and the memories of local people.